We’re heading into the middle of March and spring, the season where nature brings forth rejuvenation. As we reflect upon our professional lives this season, I’d say we are all certainly blessed to practice law in Hawaii, with an abundance of beautiful vistas, surrounded by the clear blue ocean, enveloped in year-round sunshine and nearly constant temperate weather, insulated from the harsh bitter cold and snow that winter brings to other climates. Still, many of us will take time away from our busy practices to re-energize, taking part in the annual ritual of “spring break”. Perhaps ironically, many of our fellow attorneys will head to cold, snow-covered slopes for a change of pace and enjoy fun-filled days at play in the snow. 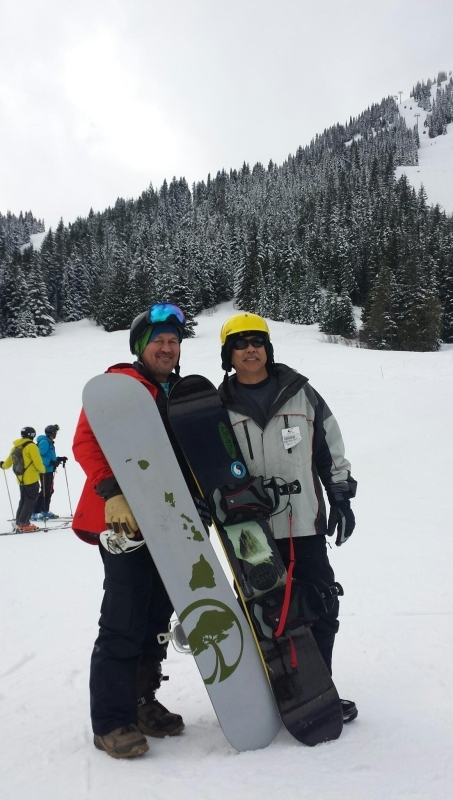 HSBA member (inactive) Jordan Wagner of Kent, WA and HSBA President Derek Kobayashi at Crystal Mountain, March 2018. As we refresh ourselves, I truly hope that during this spring season, we each likewise take the time to revitalize our efforts to meet our HRPC Rule 6.1 aspirational goal of delivering 50 hours, and more, of pro bono legal services to persons of limited means and to persons who may not be able to afford legal services. In this regard, at recent meetings of the HSBA Delivery of Legal Services to the Public Committee (“DLSP”), we have gratefully recognized the continuous and dedicated service of our members who regularly volunteer for shifts at the courthouse Access to Justice Rooms and Self-Help Centers across the state. DLSP receives regular monthly reports, including feedback from surveys in which users consistently voice their appreciation for the service by our members. DLSP also recognizes the ongoing need to grow and rejuvenate our volunteer base, particularly on the Neighbor Islands, where there are fewer bar members to serve the available shifts at the Self-Help Centers. If you are already a volunteer and have any ideas on how DLSP may re-energize our volunteers, please contact me. If you are not already a volunteer, in the spirit of the season, please consider “springing” into action and becoming a volunteer by clicking on this link. 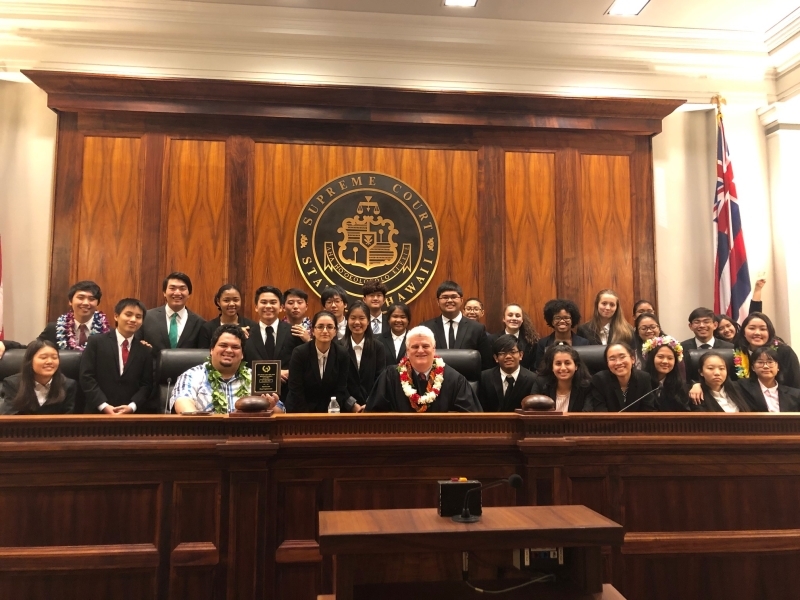 Congratulations to Moanalua High School the state mock trial champion who will represent Hawaii at the National High School Mock Trial Competition in Athens, Georgia in May 2019! After five weeks of spirited competition, four teams advanced to the semi-final rounds. The Hon. Lisa M. Ginoza and Hon. Gary W.B. 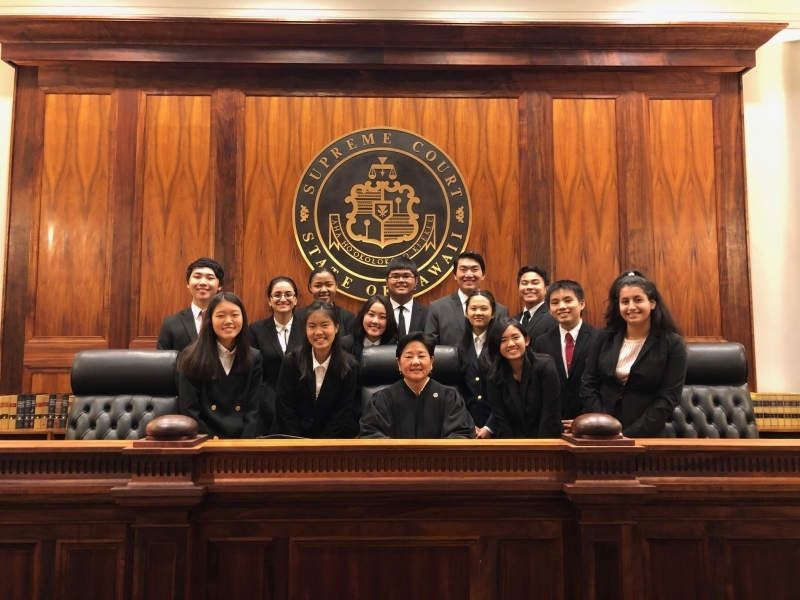 Chang presided over the semi-finals, and Chief Justice Recktenwald presided over the final round on March 9, 2019. The final rankings are as follows: first place - Moanalua Blue; second place - Moanalua Silver; third place - Island School; and fourth place - Pearl City White. The YLD Board sends its warmest thanks and congratulations to the talented student participants from all schools, including Moanalua, Island School, Pearl City, Punahou, Mililani, Saint Louis, Hawaii Baptist Academy, Nanakuli, Waipahu, McKinley, and Kauai High. We admire your dedication to this competition, and hope to see you as future members of our Hawaii bar. Thank you to volunteer coaches David Suzuki, Brian Kang, Tana Cambe, Andrew McMullen, Ted Chihara, Kim Torigoe, Tawnee Sakima, Tammy Yoon, Michael Bird, Eileen Nims, Maria Penn, Jackie Kong, Chastity Imamura, Robbie Murakami, Casey Tamayose, Allie Kaaloa, Daisy Hartsfield, Ian Ferris, and their respective school administrators, teachers, staff, for volunteering their time to coach the students in this competition; the Hon. Judges Wong, McWhinnie, Domingo, Shintani, Marr, Crabtree, Kubo, Eddins, Kupau-Odo, Nishimura, Morikone, Nakasone, Hiraoka, Kawashima, Park, Hartley, Remigio, Ginoza, Gary Chang, and Chief Justice Mark E. Recktenwald for presiding over the competition and providing students with invaluable feedback; YLD Mock Trial committee chair Addison Bonner, committee leaders Katherine Lukela and Kyleigh Nakasone, and members Michi Momose, Christilei Hessler, Christopher St. Sure, Elaine Chow, and Michelle Ching for all your hard work and dedication; Kelsey Yamaguchi for volunteering; and HSBA Executive Director Pat Mau-Shimizu, Member Services Coordinator Adrienne Hayashi, and Communications Coordinator Brian Simon for supporting this program. This is a wonderful volunteer opportunity – it takes only a fraction of your day to provide someone with helpful legal information. Law Week culminates in our state wide pop-up legal clinics on May 10-12. Contact Law Week committee chair Kyleigh Nakasone for more information and to sign up. Join us at Bar 35 (35 N. Hotel Street) at 5:30 p.m. on Friday, March 29, 2019. All HSBA members welcome. No host bar. Pupus sponsored by Watanabe Ing LLP. Thank you Cades Schutte LLP for sponsoring March 2019 legal lines! We’d also like to thank Ryan Hamaguchi, Michi Momose, Mallory Martin, Pohai Campbell, Lisa Swartzfager, Dana Barbata, Janjeera Hail, Nate Yang, Richard Sakoda, Miriah Holden, and Derek Wong for volunteering this month, and HSBA Director of Programs and Events, Katra Cuskaden, for supporting this weekly volunteer program.